Doncaster played out a goalless draw with Middlesbrough to extend their unbeaten run to four games and move five points clear of the Championship relegation zone. The hosts dominated the first half but chances were few before Boro's Emmanuel Ledesma shot wide. James Coppinger's effort was saved by Boro keeper Shay Given and Chris Brown missed a glorious close-range chance. Brown also had a volley cleared off the line in injury time but Boro held on. It was a third consecutive game where Aitor Karanka's team have failed to score and they slipped to nine points off the Championship play-off places. But with Middlesbrough playing with a lone striker, their safety-first tactics paid off as they recorded a second successive clean sheet. They looked more menacing in the second half but were unable to find the net in a game in which both defences finished on top. 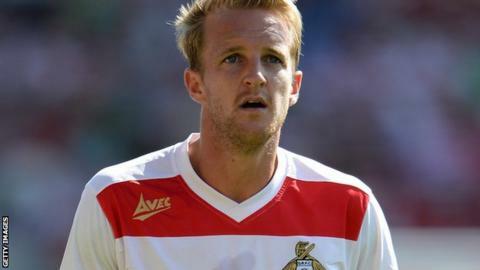 Doncaster had a definite edge and grew in confidence as the first half progressed with Coppinger heading wide early on and having a later shot deflected wide. Middlesbrough improved after the break and should have gone ahead when Grant Leadbitter produced a superb throughball for Ledesma to race on to but he placed his shot just wide of the mark. Coppinger had a fierce angled drive saved at the second attempt by Given in the 57th minute. But Doncaster's on-loan goalkeeper Sam Johnstone did not make his first save until three minutes later when he held on to a header from Curtis Main at the near post following good work by Ledesma. Both sides went close in a frantic finish with Brown twice denied a winner. "I thought we had the better of it but a draw was probably a fair result overall. "It was a scrappy match and it was hard to get the ball down and play because of the conditions. "Middlesbrough are a good team and we knew they would be dangerous on the break but I thought we posed more of a threat overall." "It was difficult for both sides in the windy conditions. But when you can't play you need to fight and we didn't do that. "When you don't play and you don't fight it makes it difficult to win the game and is an embarrassment for our supporters. We have a huge away following. People came to support us and we didn't play for them like we should. "Doncaster were better than us at fighting for the ball and, in the circumstances, I'm happy to get a point." Match ends, Doncaster Rovers 0, Middlesbrough 0. Second Half ends, Doncaster Rovers 0, Middlesbrough 0. Foul by James Husband (Doncaster Rovers). Attempt blocked. Chris Brown (Doncaster Rovers) right footed shot from the centre of the box is blocked. Assisted by David Cotterill with a cross. Corner, Doncaster Rovers. Conceded by Ben Gibson. Delay in match Dean Furman (Doncaster Rovers) because of an injury. Dean Furman (Doncaster Rovers) wins a free kick in the attacking half. Attempt blocked. Mustapha Carayol (Middlesbrough) right footed shot from the right side of the box is blocked. Assisted by Danny Graham. Offside, Middlesbrough. George Friend tries a through ball, but Danny Graham is caught offside. Foul by Chris Brown (Doncaster Rovers). Attempt missed. Kei Kamara (Middlesbrough) left footed shot from the left side of the box is close, but misses to the right. Assisted by Grant Leadbitter. Substitution, Middlesbrough. Kei Kamara replaces Daniel Ayala. Corner, Doncaster Rovers. Conceded by George Friend. Corner, Doncaster Rovers. Conceded by Dean Whitehead. Substitution, Doncaster Rovers. David Cotterill replaces Mark Duffy. Attempt missed. George Friend (Middlesbrough) left footed shot from outside the box misses to the left. Assisted by Mustapha Carayol. Bongani Khumalo (Doncaster Rovers) wins a free kick in the defensive half. Foul by Mustapha Carayol (Middlesbrough). Attempt missed. Danny Graham (Middlesbrough) right footed shot from outside the box misses to the left. Assisted by Emmanuel Jorge Ledesma. Offside, Middlesbrough. Grant Leadbitter tries a through ball, but Mustapha Carayol is caught offside. Attempt blocked. Gabriel Tamas (Doncaster Rovers) right footed shot from outside the box is blocked. Assisted by Mark Duffy with a cross. Delay in match Mark Duffy (Doncaster Rovers) because of an injury. Mark Duffy (Doncaster Rovers) wins a free kick in the attacking half. Substitution, Middlesbrough. Danny Graham replaces Curtis Main. Substitution, Middlesbrough. Dean Whitehead replaces Jacob Butterfield.